If you haven’t heard from the constant lawn coverage in Virginia this week, Michael Vick is out of jail. His motorcade was mapped out from his jail cell in Kansas to his home in Virginia. You talk about nothing going on. I mean I’m sick and tired of this. How is it that someone who is released from jail now has to have non stop coverage of his every move. Do we really need to know that he will be working for $10 an hour at a construction job? Do we really need to know that he will be electronically monitored? Do we really need to know that he is not allowed to have a dog? I will go ahead and answer these questions without any b-s answer from a spokesperson or attorney. Working for $10 an hour brings him to reality compared to the millions he threw away for something so heinous. The monitor is so the same people who put him away can come down on him for so much as driving by a dog park. Of course he should not be allowed to have a dog. I would not let him have a goldfish. The main issue I have with this is not that he was released too soon. Not even the media coverage, although it’s tough for me. 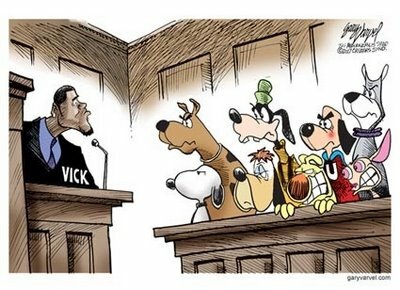 The problem that I have is with Michael Vick’s outlook on the rest of his life. Forget football Mike. That should be the least of your worries. Yes someone will take a chance on you, but you still need to face that fact that Commissioner Roger Goodell holds your key in his hands. You did lie to him before you were indicted on the charges and later plead guilty. He’s not going to forget that I guarantee it. My question to you is are you truly sorry for what you did and regret every minute of it? Or are you sorry that you were caught? That was my question two years ago and still is today. Do you regret doing it or getting caught? I really can’t stand these animal rights groups. That’s the only thing I have Vick’s back on. Yes they have free speech and can say what they want. Enough is enough though. The man served his time and if he truly is sorry and helps spread the word about animal abuse, let it alone. It seems that Peta will be mobilizing when and if he gets back in the NFL to protest his reinstatement. For the record I would stand in front of Peta headquarters and eat a bucket of KFC extra crispy chicken as my way of protesting them. No doubt. I believe this man is truly sorry, but I can’t be sure about it until he shows it. 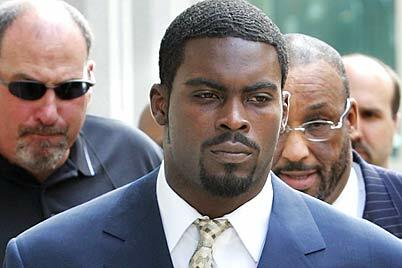 The picture above shows Michael Vick at his press conference after being indicted on federal dog fighting charges back in 2007. What a joke of a presser that was. Reading a prepared statement from your attorney. Not showing any remorse for your actions and not realizing that you are not invincible from the law. You have had a long time to think about what you did and what you could have done differently. You can’t dwell on that now. Stay down, show up to see your probation officer and don’t even think about playing in the NFL this year. Mr. Goodell will not welcome you with open arms and the majority of the league will not want you. Maybe your knuckle head teammates who flaunted “Free Mike Vick” t-shirts during a game in 2007 will, but that was before they realized what you did. I look forward to seeing you 24-7 since our culture dictates we must know your every move. Memo to the NFL network in particular. I know it’s the most boring time of the offseason, but shut up about Michael Vick now. Same to you ESPN. He is not reinstated. Stop the speculation on who he would be a good fit for. Never has an athlete that was considered the best in his sport fallen so fast.